I normally use commercial antennas for GPS (e.g., patch antennas with a magnetic mount), but I needed more antennas than I had so I built a couple of J-Pole antennas for 1575 MHz. I started with dimensions from an on-line calculator and built an antenna using a 1mm enameled copper wire. 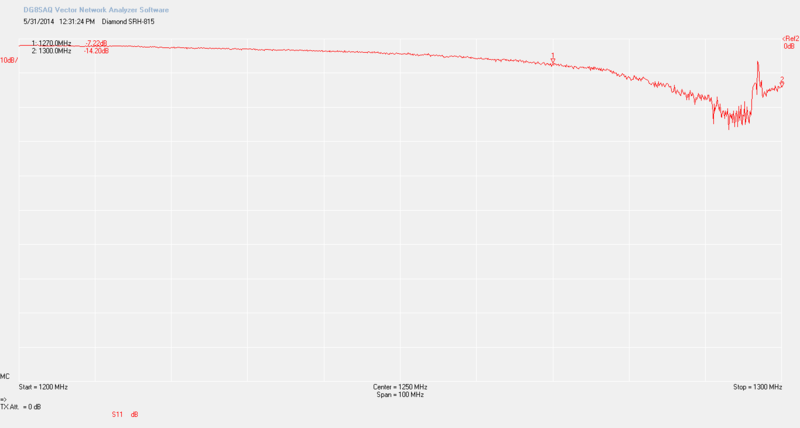 The return loss (SWR), measured with a portable VNA, was not good. I started again with a slightly longer antenna, which resonated about 100 MHz too low, and started cutting it until it resonated on 1575. The return loss is about -15dB; not great, but good enough. 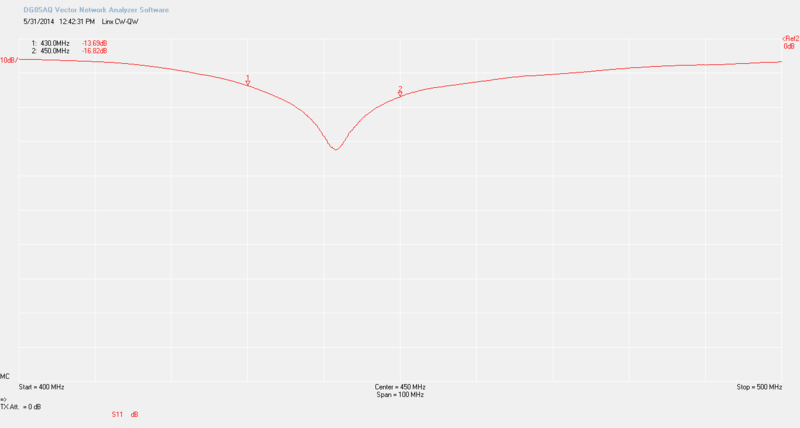 Given that there are 3 different dimensions to worry about (the length of the radiating half-wave section, the length of the quarter-wave matching section, and the location of the tap on the matching section), I decided not to try to tweak it to perfection. 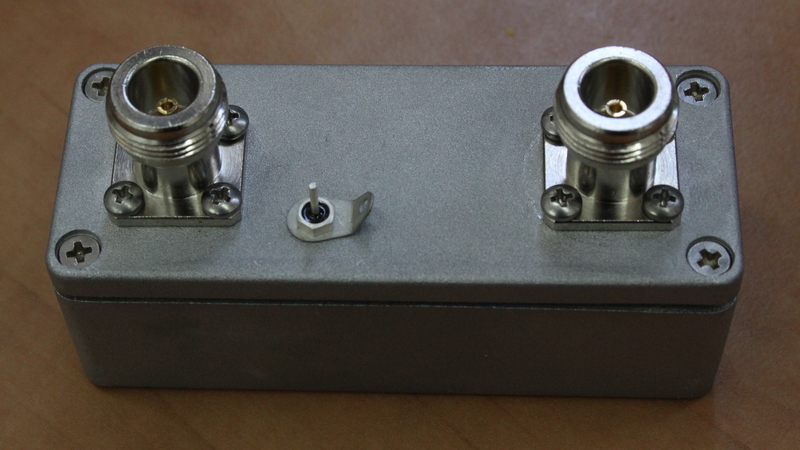 The antenna is soldered directly to two terminals of an SMA connector. This is a through-hole PCB connector, which has 5 terminals (5 for ground and 1 for the center conductor). I chopped 3 of the ground terminals so only two were left protruding, and I soldered them to the antenna. 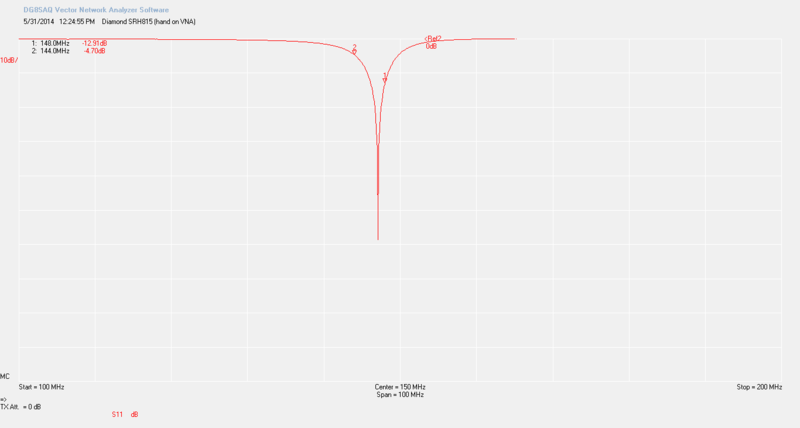 I then made a second antenna with the same dimensions; it produced a -15dB return loss on the first try. 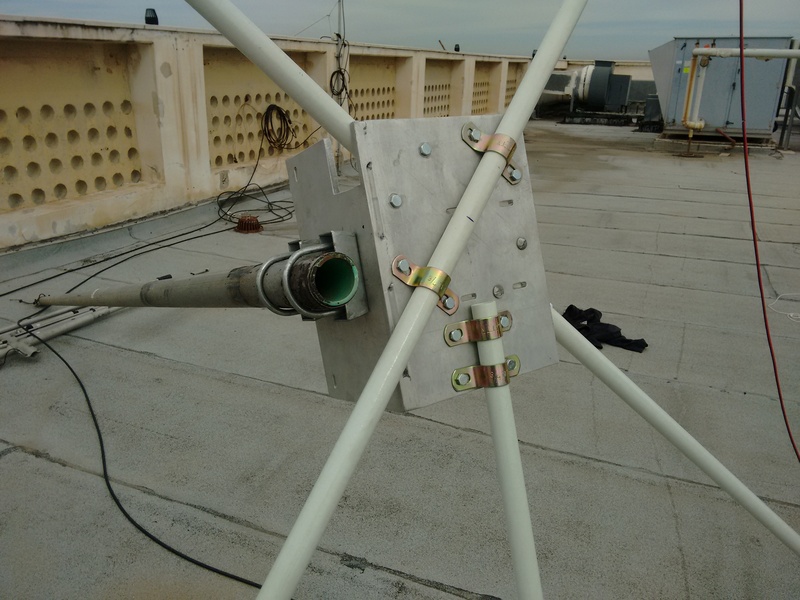 The length of the λ/4 stub in my antennas is 45mm, the lenght of the λ/2 radiator is 102.5mm, separation between the arms of the sub is about 3mm, and the feed point about 8mm from the shorted end of the stub. 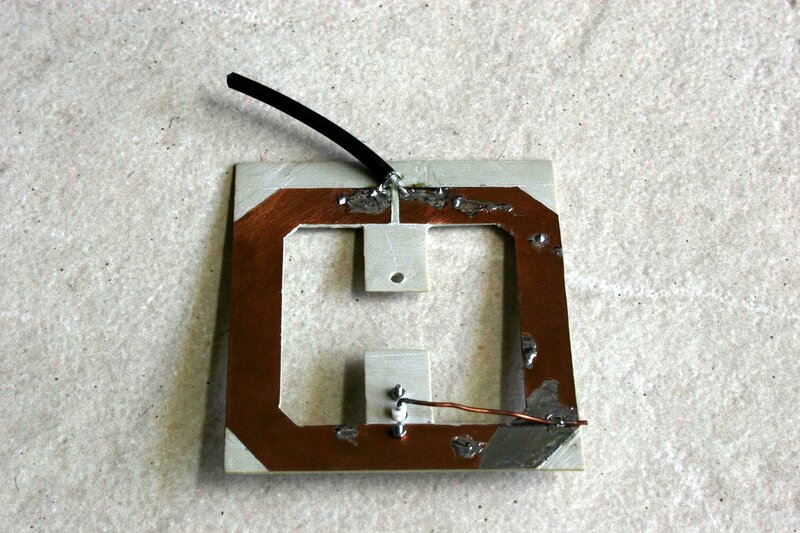 In one of the antennas I inserted a 1000pF 0603 ceramic capacitor between the center conductor of the connector and the antenna, so that it does not short at DC. This allowed it to be used with GPS receivers that provide bias voltage to an LNA. Without the capacitor, the antenna shorts the GPS receiver, since the bias voltage is usually not current limited. With this antenna connected to a NavSpark Mini GPS receiver outdoors, I was able to easily get a fix. 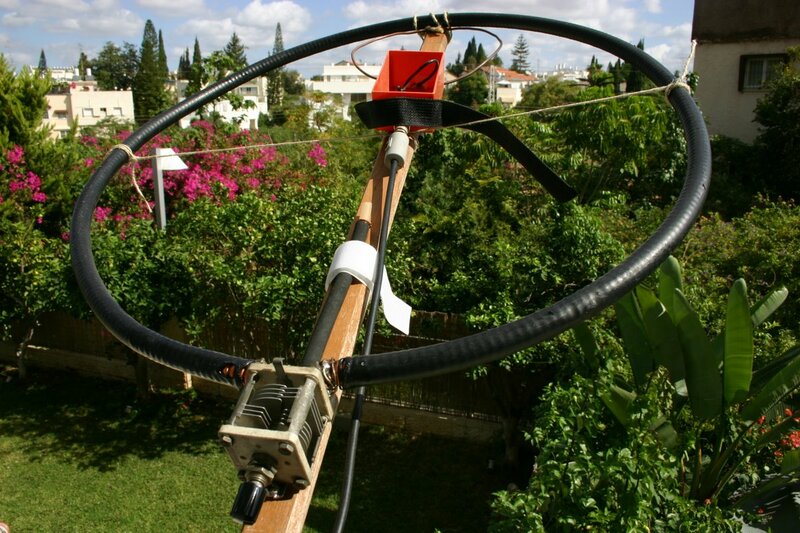 Yesterday I finished building a CobWebb antenna, together with Itamar Melamed. 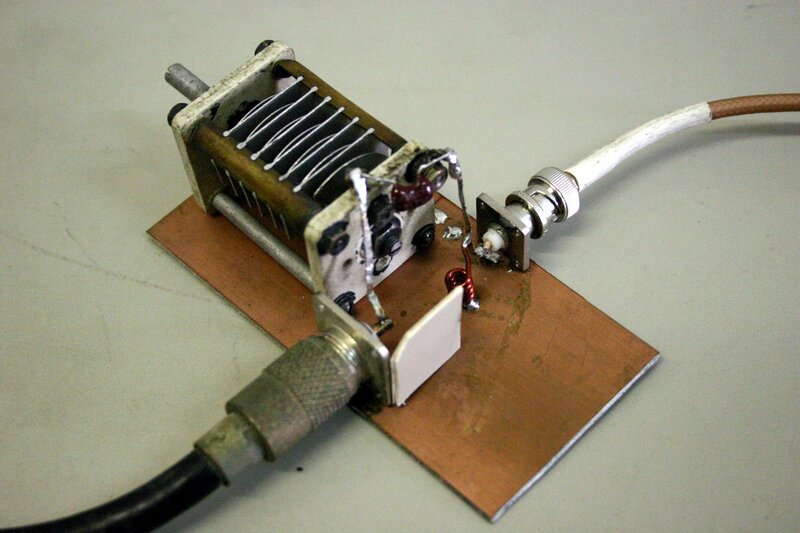 The CobWebb is an HF antenna for the 14, 18, 21, 24, and 28MHz bands. It was designed by Steve Webb, who used to sell it (his web site seems to be inactive). The antenna is basically a fan dipole (five dipoles fed in parallel) in which the dipoles have been folded into squares. The folding makes the antenna compact; it fits into a square with a side of less than 3m. The folding also reduces the feed-point impedance down to something like 12.5 Ohm. The radiation pattern is omnidirectinoal. I started the construction from the frame. I wanted the antenna to be rigid and to survive winds, so I built it out of fairly thick fiberglass poles, 25.4mm diameter with 2.85mm wall. The poles are very stiff. 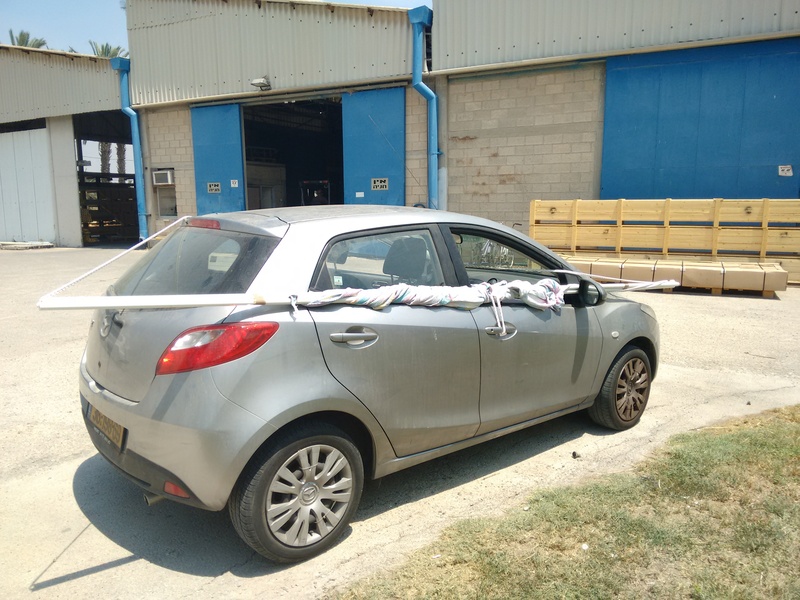 I could not find such poles at local distributors, so I drove to the factory that makes them (Pas-Gon), bought two 6m poles and had them cut into two 4m segments, one 1.3m for the feedpoint, and some leftovers. Driving back in a small car with the 4m poles strapped to the outside of the car was interesting (it’s a 2h drive). I decided to use 4m poles in order to achieve maximum strength; you can also make the antenna from four 2m arms. The center support is a heavy aluminum bracket. I wanted to have the support made at a workshop, but it turned out that they had something almost suitable that somebody ordered but never picked up. 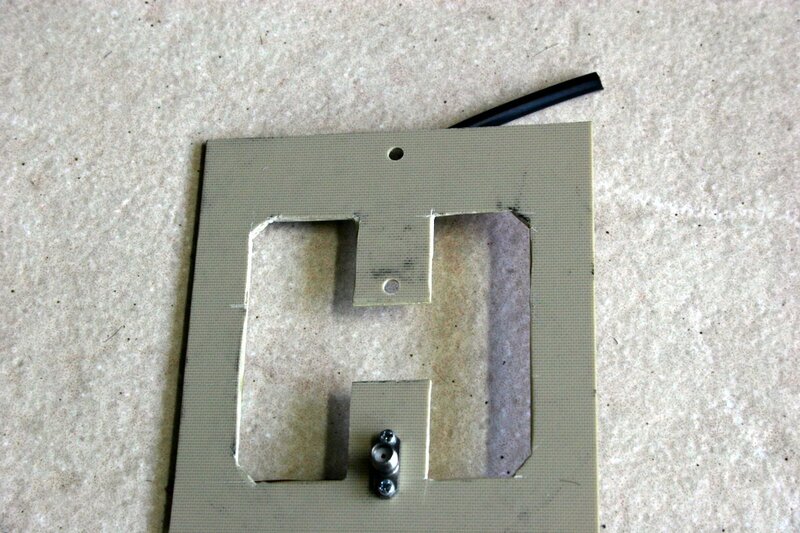 They modified it for me by drilling holes and by cutting part of the aluminum to allow the lower poles to pass through. This part too is very strong and stiff. There are two ways to feed the CobWebb. Webb’s original design is very clever. It used a balanced T-match to match the 50Ω coax to low impedance at the center of the dipoles. He constructed the antenna from twin-lead multi-strand copper wires, such as the ones used as speaker cables or mains zip-cord. 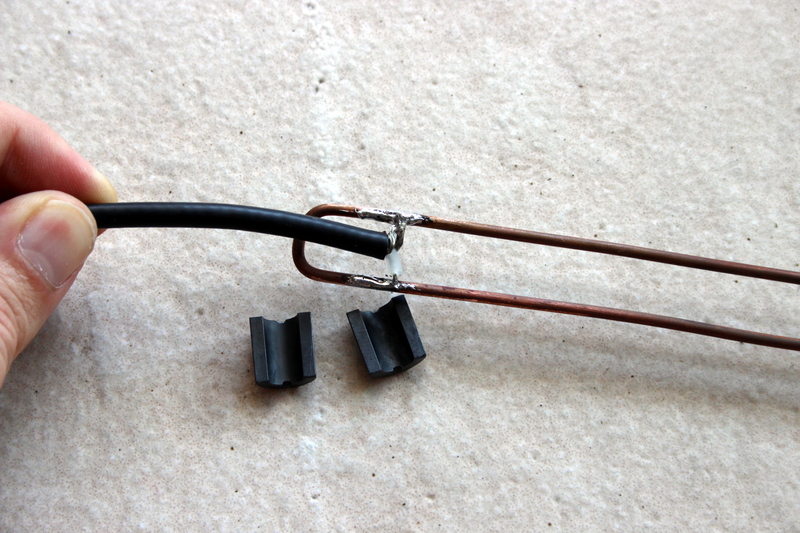 One wire in each dipole is left whole; the other is broken in the middle and connected to the coax. The two leads are shorted some distance away from the center, in each side of the dipole; these are the actual feed points of the dipole. By moving the short towards the center or the ends, the resistance of the antenna at resonance changes. The use of the zip-cord T match makes mechanical sense and it feeds the antenna without any ferrite transformer. The design is well documented in a PDF document on the web, which includes measurements of the elements and the short points (I think the document was put together by Steve Topping, but it is not signed so I am not 100% sure; there is one error in it, reported by Alan Reeves: the sides of the 18MHz dipole should be 4040mm long, not 4400mm). 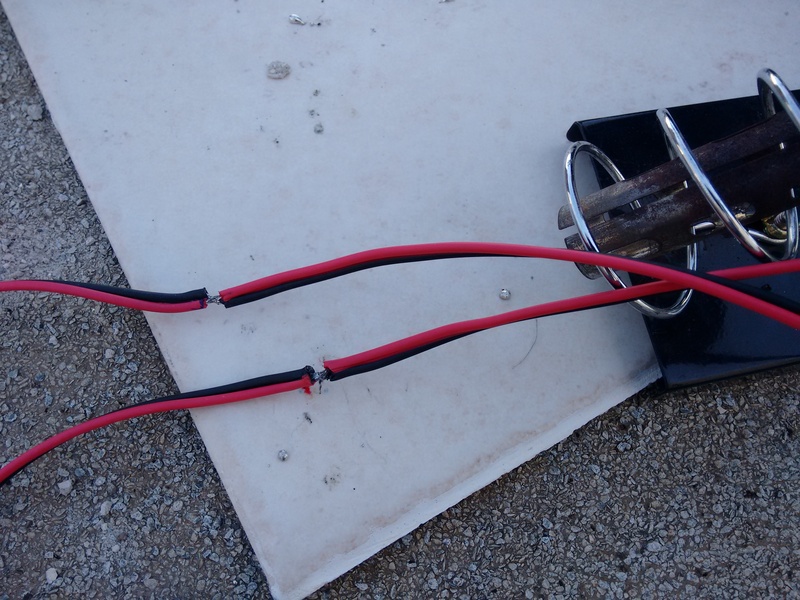 One builder, Steve Hunt, disliked the T-match arrangement and came up with an alternative matching mechanism: a pair of 1:1 current baluns arranged to create a 1:4 balun. Transforming 50Ω to 12.5 effectively requires a low-impedance transmission line, which Hunt achieved by paralleling two 50Ω coax cables. One aspect of the T-match that worried Hunt was the difficulty of moving the short point to acheive a 50Ω impedance. This is indeed not easy, and I, like many other builders, decided to try out the transformer feed. I was also worried that the optimal short points would depend on the specific properties of the zip-cord and that the measurements of the original design would not work with the zip-cord I decided to use. I built the transformer using RG-142 coax, which can handle a lot of power, and large ferrite toroids. However, the ferrites I used did not function well at 14-28MHz (the transformer did perform well below 1Mhz, but this is not useful for this antenna). I decided not to try the original design rather than try other ferrite. Itamar and I started by preparing just the 18MHz wire assembly with temporary short points (not soldered yet) and connected it temporarily to a BNC socket. 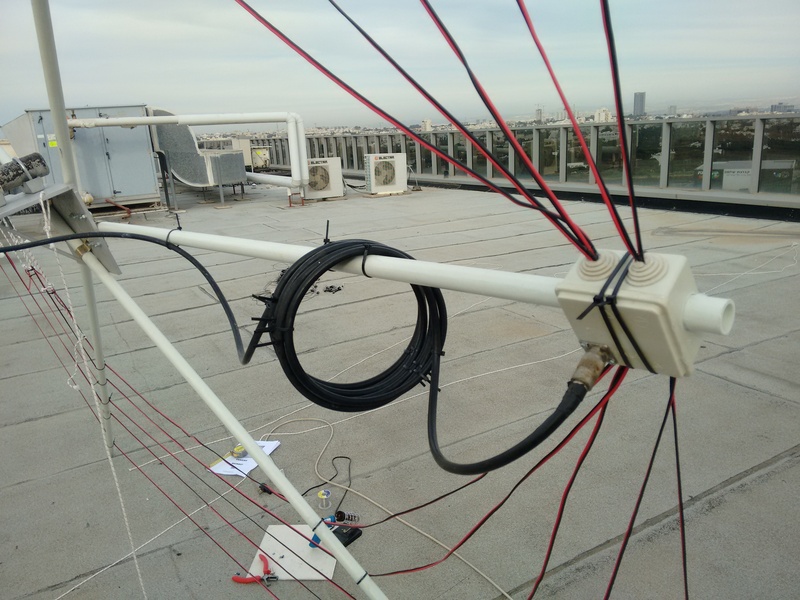 We hoisted the antenna and measured the impedance with a VNA (vector network analyzer) that we calibrated to the end of the coax. 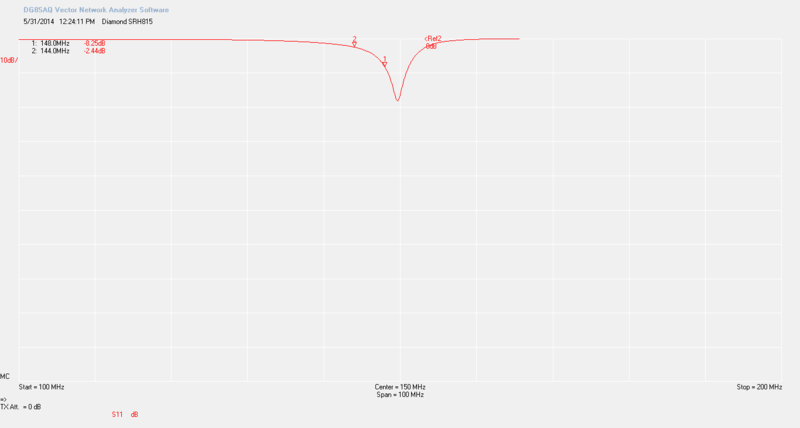 The results seemed good; the resistive part was close to 50Ω and the resonance was close enough to the target frequency that it seemed that by modifying the dipole’s length would tune it. 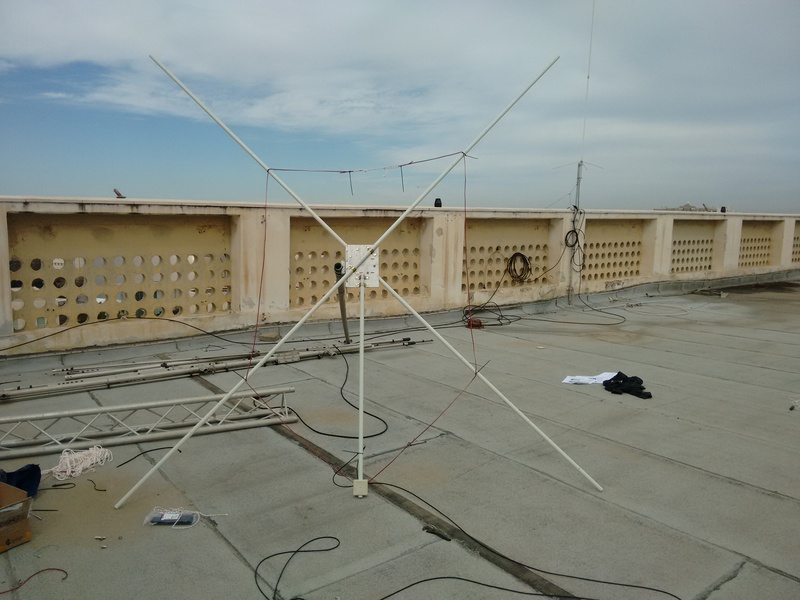 We lowered the antenna, built the rest of the dipoles, soldered the short points, built a more permanent feed-point box and connector, and hoisted it back up. Now it was time to tune the dipole’s length. The design uses dipole ends that are folded back, and Reeves advised to make the folded back sections longer, to make it possible to lengthen the dipoles; we did leave them longer. We measured the return-loss (SWR) dips to make sure the short-points were effective, and measured the resonance frequency (really the return-loss dip) at all bands. 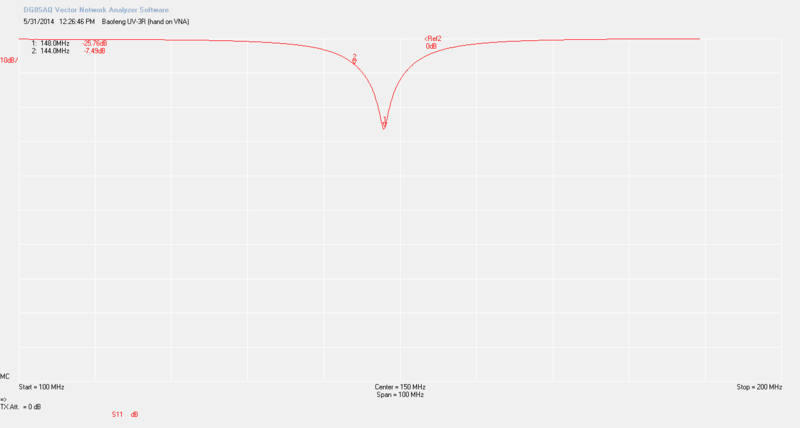 We calculated roughly by how much we need to shorten or lengthen the dipoles on each band, and tried to do this by changing the fold-back length, but without changing the physical length of the wires. This did not work, so I assume that Alan Reeves is right that the foldback essentially lengthens the dipoles. 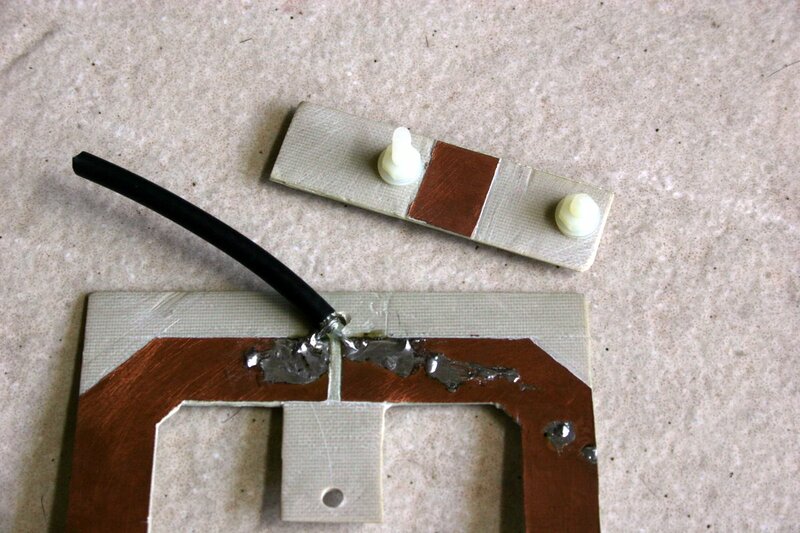 Next, we cut the elements whose resonance was too low and soldered pieces of wire to elements with resonance too high. This seemed to do the trick. Alan Reeves reported matching problems on 14MHz; our version works fine there too. We lowered the antenna one last time (out of 6 or 7), weather proofed it (I hope), added a coiled-coax choke, and fixed it in place. The bandwidth of the antenna is less than spectacular. On 14MHz, the SWR≤3 bandwidth is close to 500kHz, so at the edges of the 14, 21, and 28MHz bands, the antenna might need a tuner. I just got a vector network analyzer (VNA) from SDR Kits and after performing the calibration procedure, I decided to try it out quickly on a few VHF and UHF antennas. The version I got is called VNWA 3E. The antennas I tried were the 144-148MHz rubber ducky that came with a Kenwood TR-2500 (some 30 years ago), an 434MHz rubber ducky that came with the Texas Instruments (SPWH24433TI made by Pulse Larsen), an 144/430/1200MHz Diamond antenna (SRH815), short VHF and UHF antennas that came with a Baofeng UV3R, and a 145MHz PCB magnetic loop that I built a while ago. You can see the VNA and the antennas (ordered from left to right) in the picture on the right. 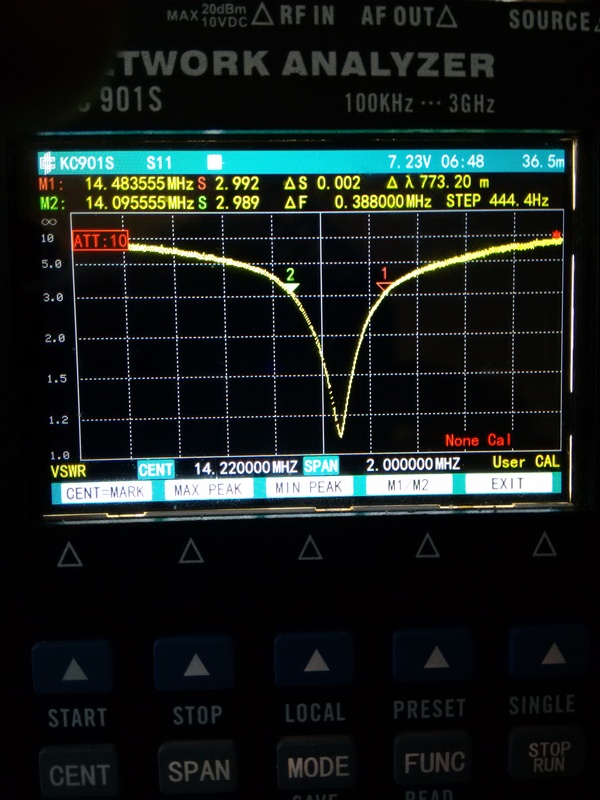 The Kenwood antenna performs reasonably well in its design frequencies, but at least when mounted directly on the VNA (as opposed to being mounted on the transceiver it was designed for), it resonates a little higher than its design frequencies. When I placed my hand on the VNA, the resonance frequency dropped significantly, to well below 144MHz. Placing my hand on the VNA puts the antenna in a fairly similar environment to the one it was designed for, namely being on top of a handheld transceiver. Either with my hand or without it, the SWR between 144 and 148MHz was not much worse than 3:1 (return loss of -6dB). Staying on the same band, the Baofeng antenna performed a little worse. Without my hand the return loss was as low as -4dB. With my hand on the VNA, resonance moved into the band and return loss improved. The Diamond performed poorly with or without my hand on the VNA. This is a pretty expensive antenna (about $30), so this is disappointing. The Diamond performs better at UHF, where its length is about λ/4 at 430MHz and about 3λ/4 near 1300MHz. The Pulse UHF antenna, which is also a λ/4 whip, is the best performer of the lot. The SWR is less than 1.4:1 from 430 to 450MHz. 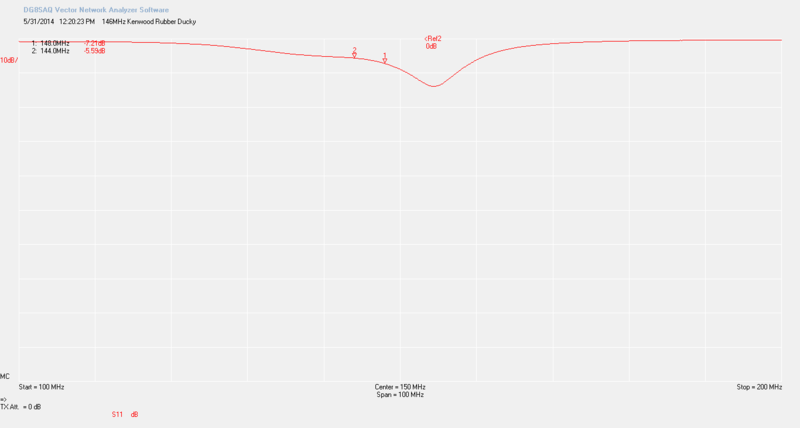 The short UHF antenna that came with the UV-3R is okay at 430MHz, but pretty bad at 450MHz. Not too bad. Finally, the loop antenna. 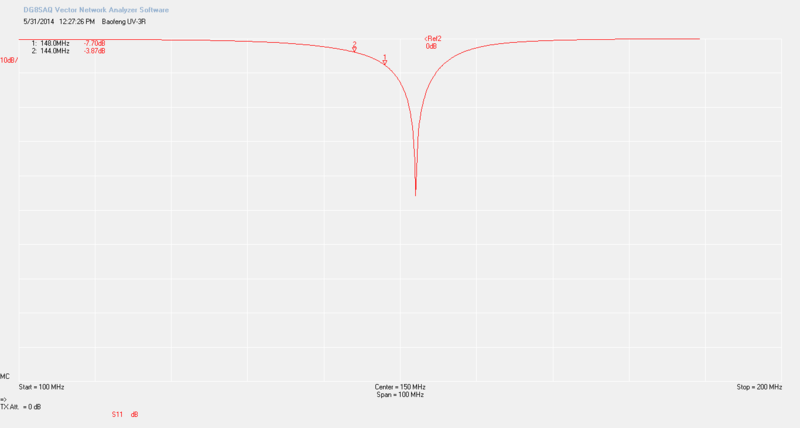 It is very narrow band, as expected from a small loop. 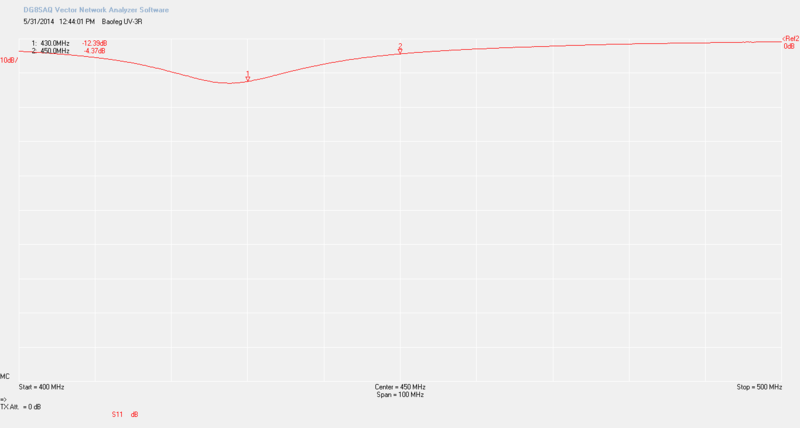 The useful bandwidth is about 1MHz. 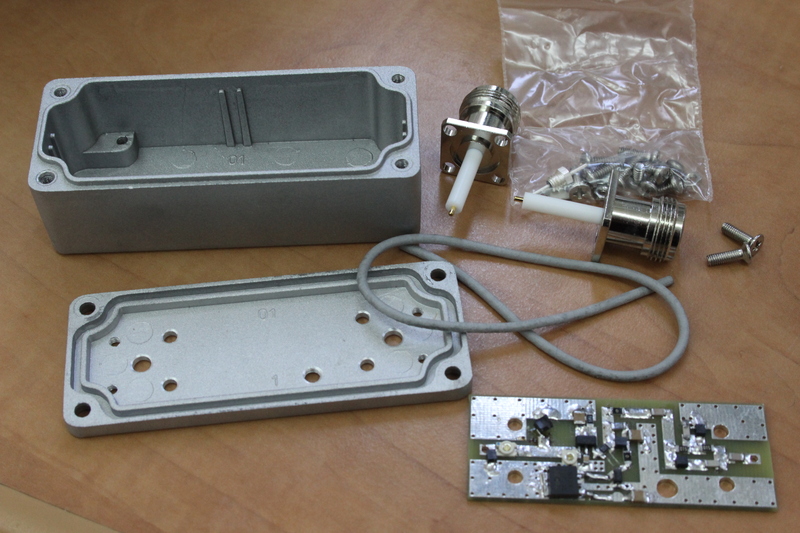 I recently built two more UHF preamplifier kits made by Down East Microwave (DEMI) and a simple reference antenna to go with them. The antenna and two preamplifiers feed a USRP radio with a WBX front end. 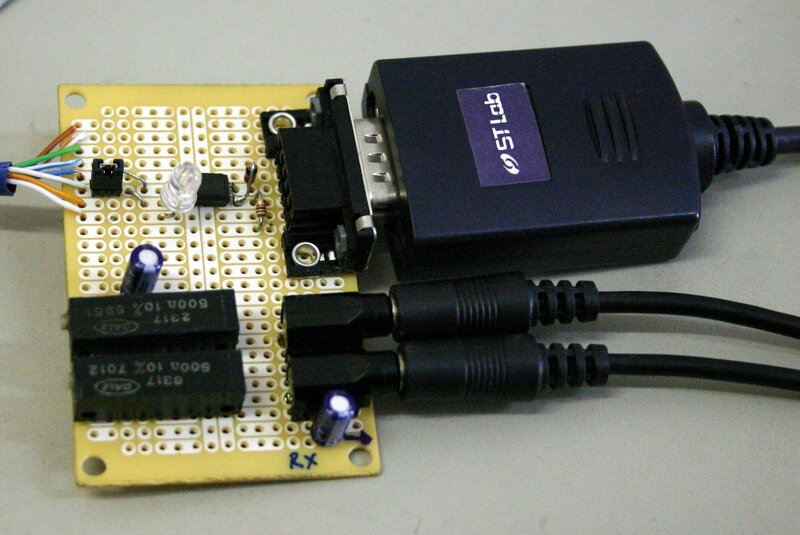 The USRP uses a 6V power supply. This created a slight logistical problem for the preamplifiers. They contain a 78M05 linear voltage regulator that drops the input voltage down to 5V. The 78M05 requires an input voltage higher than 6V, which means that the power supply of the USRP cannot power the preamplifiers; I would need a separate power supply for them, one that provides 7V or higher. This seemed a bit silly when so many low-dropout regulators are available. After searching a bit I found a 5V low-dropout regulator in the same package as the 78M05 that came with the kits (a TO-252 surface-mount package) and with the same pinout; a direct replacement. This regulator, TL720M05 by Texas Instruments, works down to an input voltage of 5.5V and can tolerate even higher input voltages than the 78M05. It does require a larger output capacitor of 22μF or higher; I used 47μF 10V SMD tantalum capacitors which fit on the printed circuit board without a problem. The parts were not expensive and I am happy with the improved functionality of the preamplifiers and the ability to use a single power supply for them and for the USRP. Incidentally, I ordered these preamplifier kits with the optional enclosure and connectors; they fit together beautifully, as you can see below. The antenna I built is a simple J-pole, which means it’s a dipole fed from one end by a quarter length matching stub. 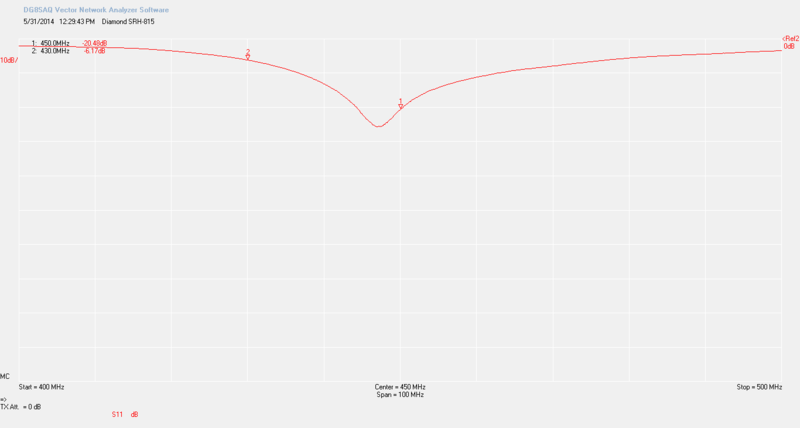 I computed the length of the stub and the radiating element using an on-line calculator. I left the radiating element a little long for tuning, soldered the coax to the matching stub at the point suggested by the calculator, and tested the antenna for low SWR with the FT-857D. The SWR was a little high. I tried the antenna up and down the 430MHz band trying to see in which direction to tune the antenna (hoping that tuning would require cutting the antenna rather than extending it). I eventually managed to tune it, but I discovered in the process that a J-pole is not an easy antenna to tune with an SWR meter alone. 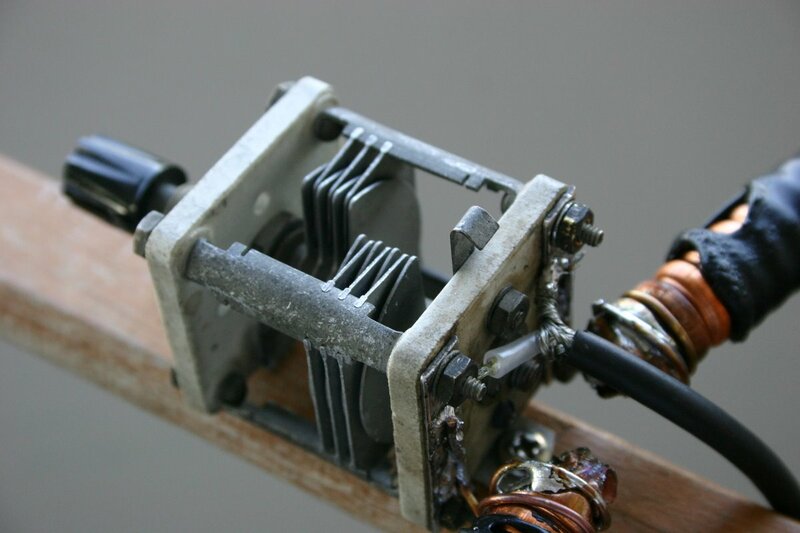 There are 3 tuning parameters: the length of the radiating element (which you can tune by chopping pieces off the top), the length of the matching stub (chopping pieces off its free end makes the stub shorter and the radiating element longer), and the connection point of the coax to the stub. The first two parameters should bring the antenna to resonance and the third should bring the resistive impedance to 50Ω. Eventually I got it close enough. In the picture on the right you can see the antenna with the coax connected. This short piece of coax is meant to connect the antenna to the preamplifier. Once it was tuned, I added a ferrite sleeve as a choke, put the antenna inside a PVC pipe with some foam to hold it in place (I also tested for resonance inside the PVC sleeve in case it affects the tuning a bit), and the antenna was ready. 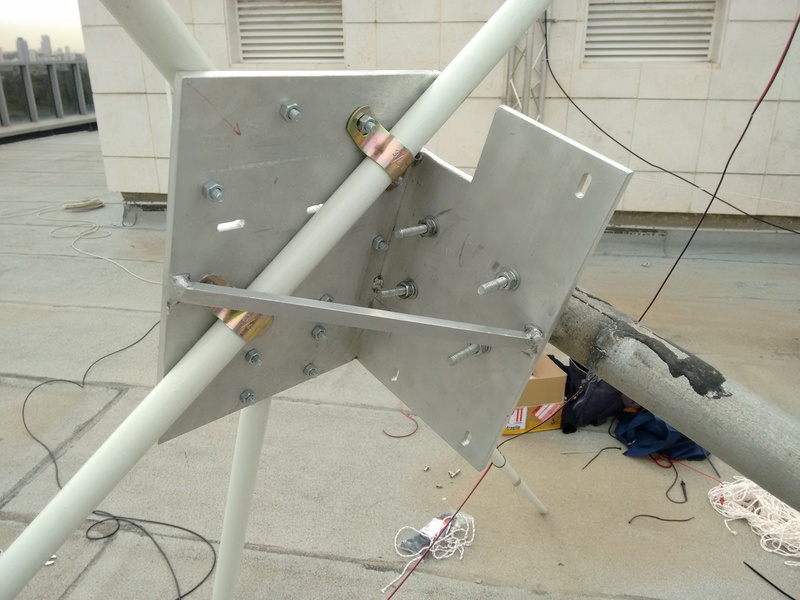 In the pictures below you can see the coax connection and the two halves of the ferrite sleeve, as well as the antenna mounted with a preamplifier on the roof. 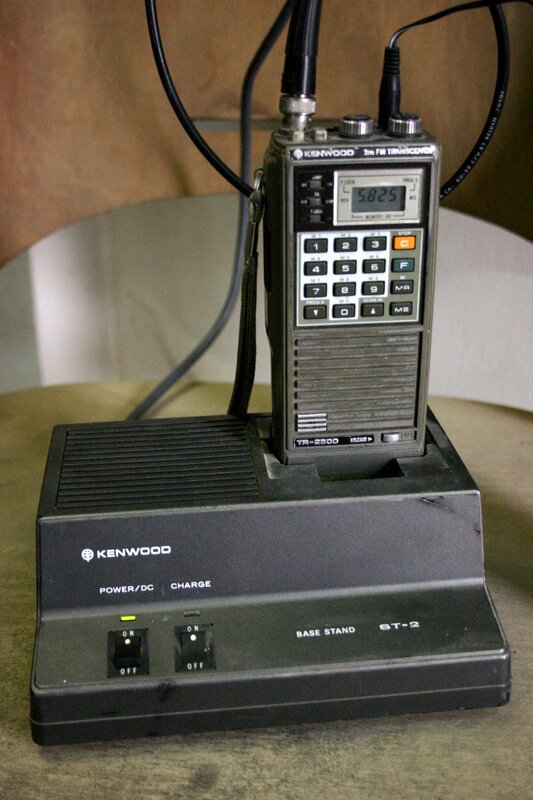 My APRS iGate has been using the old Kenwood TR-2500 that you see in the picture for a few months. The radio was connected to an old commertial VHF antenna. This antenna is not resonant on 144.800MHz, but it is sturdy and high, and it receives very well. 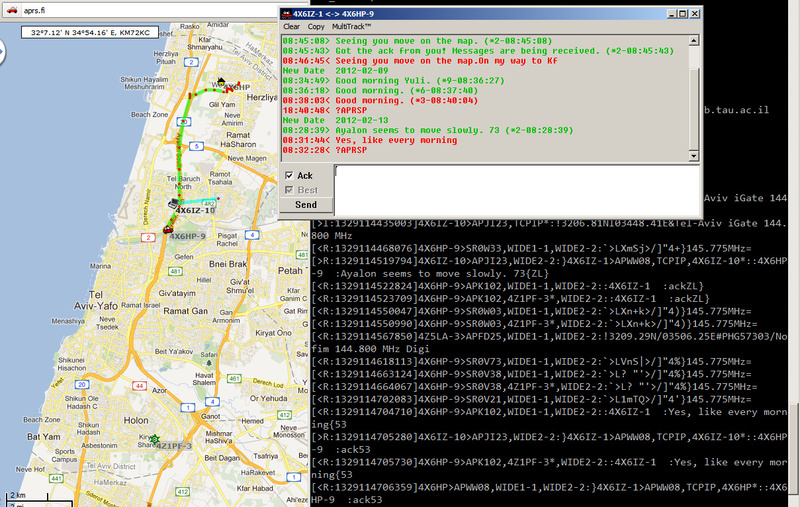 So I used it in receive-only mode; the iGate relays APRS messages from RF to the internet, but not the other way around. But when I got two old Motorola VHF radios, I decided to replace the TR-2500 by one of them, a Motorola PageTrac. This was supposed to bring two advantages. First, the Motorola radio would start up on 144.800 after a power loss, whereas the TR-2500 had to be programmed manually for 144.800 after a power loss because its memory battery has long died. Second, the PageTrac puts out 45W whereas the TR-2500 puts out only 2.5W, so if I start transmitting messages, the PageTrac would have a much better range. The plan proved more difficult to execute than I had thought. 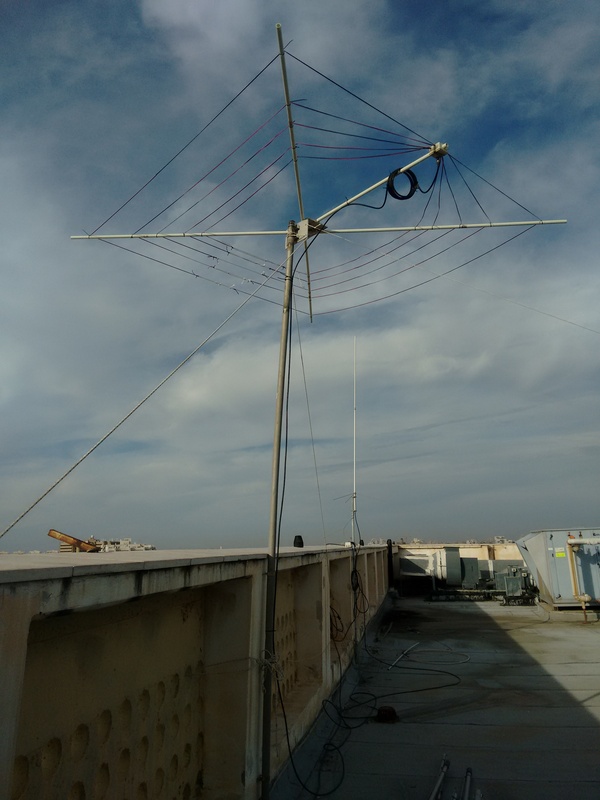 The existing antenna is sturdy, high, and mounted on an old mast that I had no desire to climb. So I decided to keep using it. 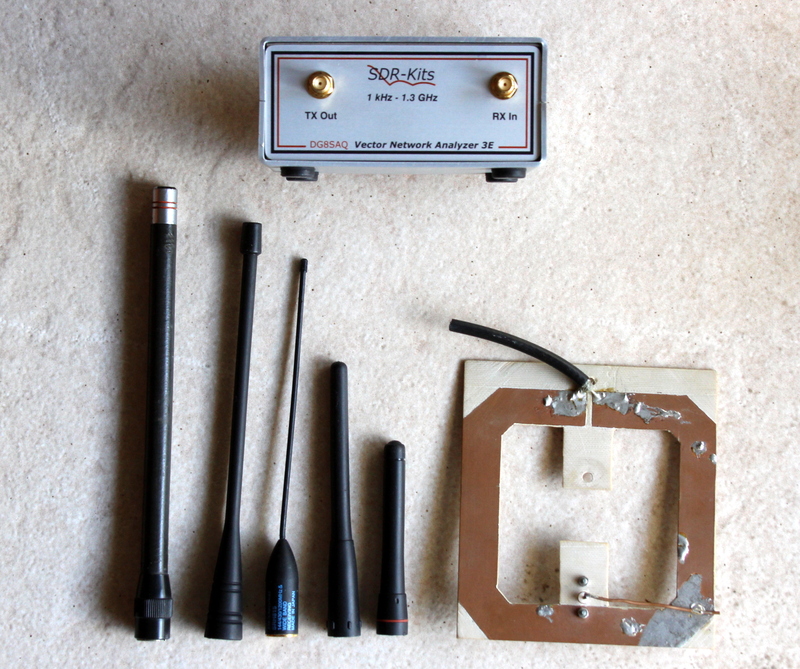 To transmit using this antenna, I needed a matching network: a single-purpose antenna tuner. 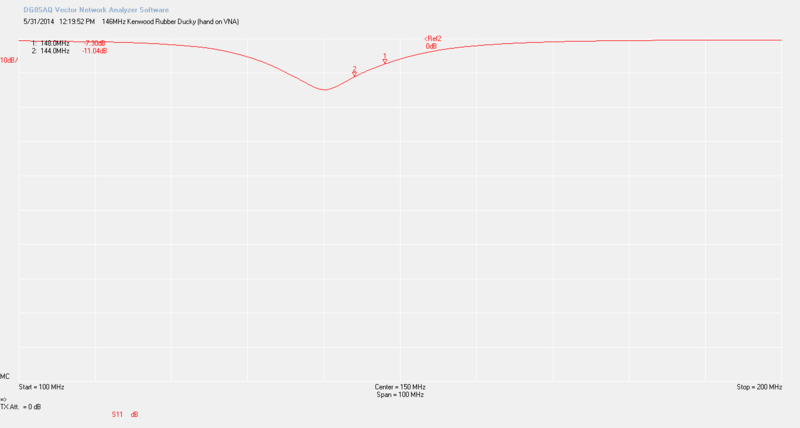 I borrowed an MFJ-269 antenna analyzer from Nir Israeli and measured the impedance of the antenna and coax at the radio-side connector (at 144.800 MHz). I then designed an L match circuit using an online calculator. I didn’t completely trust the analyzer and I was not sure that the air inductor I prepared had the correct inductance. So I used a variable capacitor in the L match, so that I could tune it. This worked out well. By adjusting the variable capacitor I was able to bring the SWR to a low value that is good enough for transmitting (I think it was 1.2:1 but I didn’t record it). The L match is narrow band and the SWR is reasonable only across about 0.5 MHz, but this is of no significance for APRS, which uses a single frequency. The online calculator gave me not one appropriate L match but two. The other solution had a tiny series inductance and a capacitor across the transmission line. I tried it (with no inductance at all) and could not get the antenna to match. I am not sure why this matching network did not work. Antenna tuners of this sort are almost never used at VHF, because it is pretty easy to build resonant antennas. But in my situation, with a good antenna that works well even though it is not resonant, this special-purpose antenna tuner is a good solution. The two Motorola radios I got are a DeskTrac, which is a desktop version of the more common mobile MaxTrac, and a PageTrac. The DeskTrac is documented very well on the web. I didn’t find any useful documentation on the PageTrac, but it is a very simple radio, so I didn’t really need much documentation. Both radios worked when I got them, but I quickly discovered that the power supply of the PageTrac was failing. Two large electrolytic capacitors were burned, and they actually charred the PCB beneath them. They were buzzing and burning when the radio was turned on. I tried to replace them, but I didn’t find replacement 15,000μF capacitors. I decided to replace the entire power supply. It was rated at 13.8V and 10A, so I needed a power supply with similar specs. 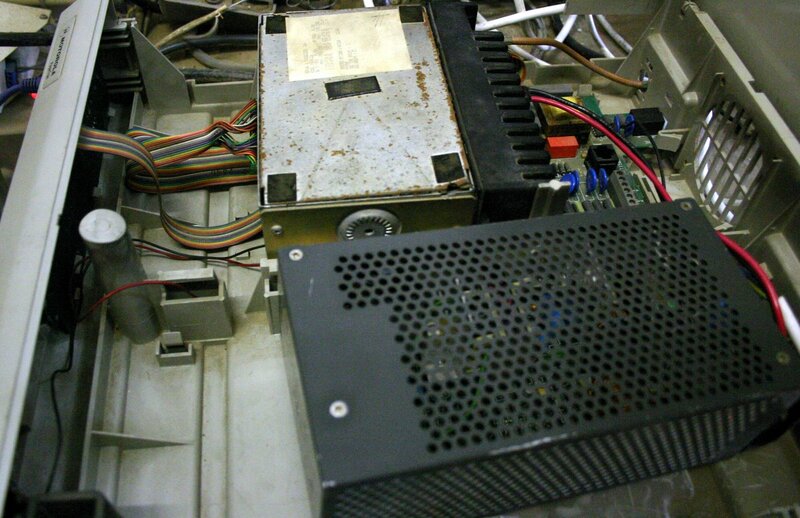 The first candidate was a power supply from a dead computer. Its 12V output was rated at 16A, so I thought it would work. I spent a bit of effort trying to raise the output from 12V to 13.8V, but this caused buzzing in the PC power supply, so I left it alone. I assumed that running the radio at 12V rather than 13.8V would reduce output a bit, but this was acceptable to me. The radio worked with the computer power supply, but whenever I tried to transmit, the power supply shut down. I am not sure why it shuts down, but my guess is that the roughly 10A that the radio draws from the supply on transmit causes the switching regulator in the supply to generate wider pulses. This maintains regulation on the 12V line, but it raises all the other outputs that have almost no load on them (5V, 3.3V, etc. ; all are generated from the same switching waveform). The over-voltage protection circuit of one of these outputs might be what is shutting down the supply. Next, I tried an old 12V/11A Lambda switching supply that I thought at a surplus store for about $5. I adjusted it to 13.8V. It works without a problem, and it is small enough to fit inside the PageTrac enclosure. It just sits in the enclosure without being bolted to it, but since the radio just sits on a shelf, this does not cause problems. To use the radio as an APRS iGate, I needed to connect it to the soundcard of the computer running the iGate software. The interface that I used with the TR-2500 was not really an interface at all: just a cable connecting the TR-2500’s earphone output to the computer’s microphone input. But with the PageTrac, I needed some kind of interface, if only to activate the transmitter. I built a simple interface with (1) DC blocking and level adjustment on both the audio input and audio output directions, and (2) a PTT activation circuit. The PTT circuit is activated by the RTS signal of a serial port, and is isolated from the radio by an optocoupler. But the audio lines are not isolated, so the radio and computer are not really isolated. So far this did not cause any problems. Initially, the interface did not work. When I would connect it, the radio would go into transmit mode, even if only audio cables were connected, not a serial cable. It took me a long time to debug, but eventually I discovered that I made a mistake in the wiring of the cable connecting the interface to the radio’s front speaker-mic connector. Once I fixed the mistake, the interface started working. The PageTrac has some limitations. One is the fact that the only audio/PTT connector available is the RJ45 speaker-mic connector on the front. It has an RJ11 connector in the back, but it is undocumented. In contrast, the backThe DeskTrac has a DB-25 jack on the back designed for connecting it for to computers and other equipment. The second is that it has no “monitor” button to turn off the squelch. APRS works a bit better without a squelch, and the DeskTrac has a button that allows you to turn it off. I also think that unsquelched audio is available from the DeskTrac’s DB-25 connector. But even through the squelched speaker-mic connection, the PageTrac works fine. Another limitation of both radios is that the speaker is never completely muted (even at the lowest volume level). To prevent the radio from sounding the APRS packets, I simply disconnected one of the speaker’s wire. Soundmodem, the soundcard-modem that I have been using with the TR-2500, did not decode packets received by the PageTrac. I thought of adding a high-pass filter to the audio interface, to compensate for a possibly too-aggressive de-emphasis, but eventually wrote a new software modem that decodes packets from both radios without a problem. But this is a topic for another post. After resolving all of these issues, the new iGate configuration is up and running. The iGate beacons on both the internet and on 144.800 MHz, and it relays text messages and other packets from the internet to mobile stations. In the screenshot below you can see me exchanging text messages with a mobile station (which uses a Kenwood D700). You can see both stations on the map, the text-message window of APRSIS32, and the actual packets that are received and transmitted by the iGate, some via RF and others via the internet. My APRS tracker seems to work quite well, but it was difficult to use with various pieces of equipment sloshing about on the dashboard. Initially, I’ve been using the short vertical antenna that came with the UV-3R radio. Both the radio/antenna and the GPS antenna were placed on the dashboard. 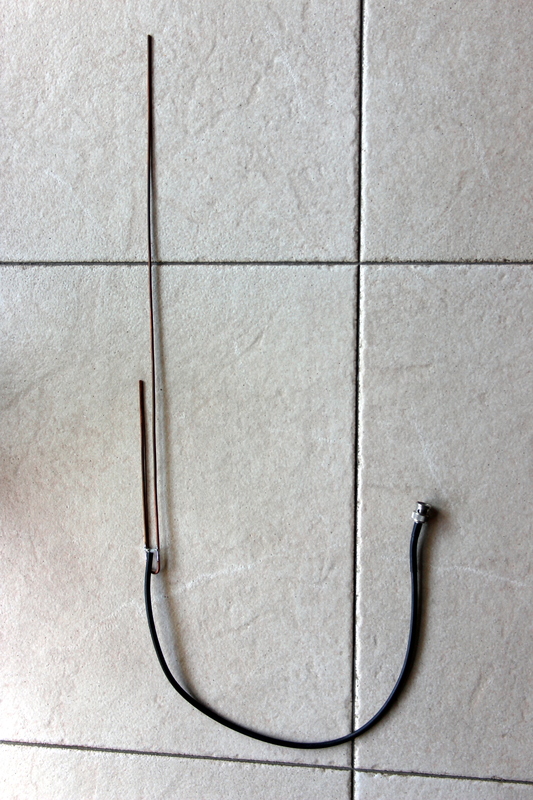 This antenna did not work well inside the car, especially when it was lying horizontally with the radio on the dashboard. 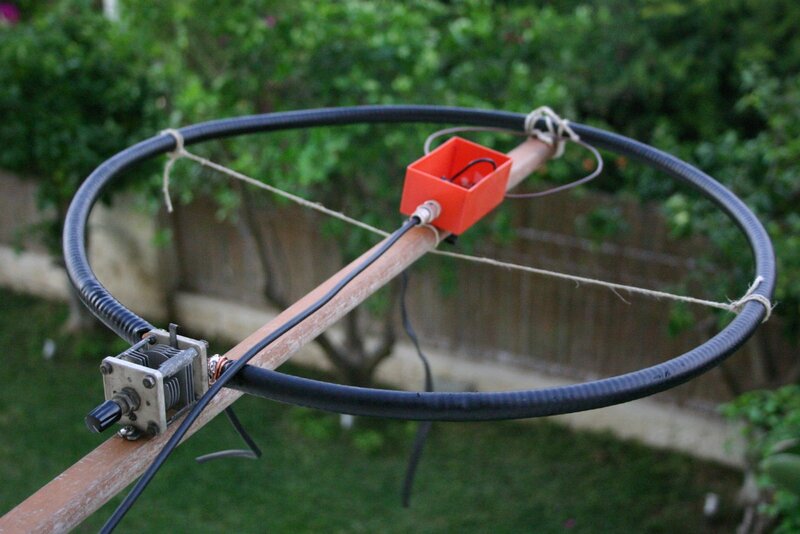 Then I switched to the small PCB magnetic loop antenna I built a while ago. This worked much better, especially when the antenna was standing up. But now I had three pieces of equipment (the radio, the loop antenna, and the GPS antenna) sloshing on the dashboard. This was only good enough for a bit of testing. I was considering how to mount the antenna and the radio more securely on the dashboard. I didn’t feel like spending a lot of effort on building an enclosure. 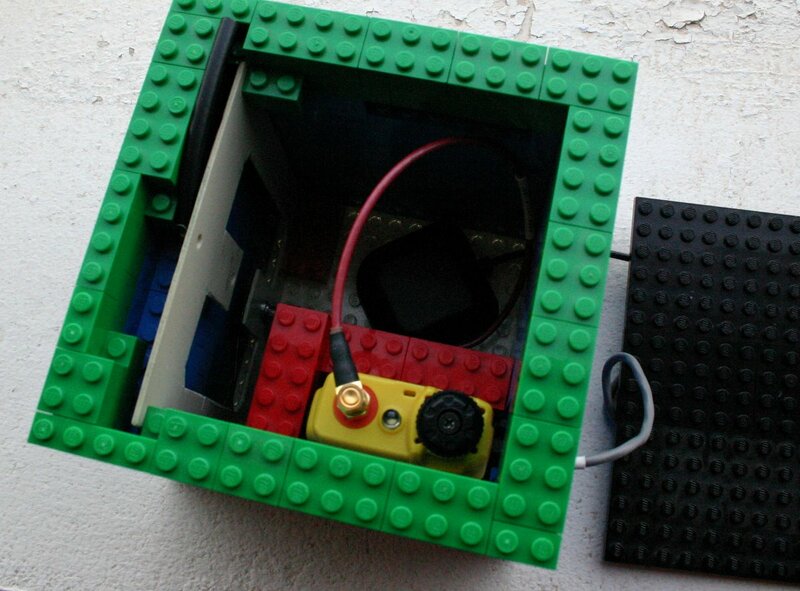 Then the idea of building the enclosure, or at least a prototype, from Lego. The box you see in the picture above is the result. It actually works very well. It’s a bit heavy, so it doesn’t move at all on the dashboard. 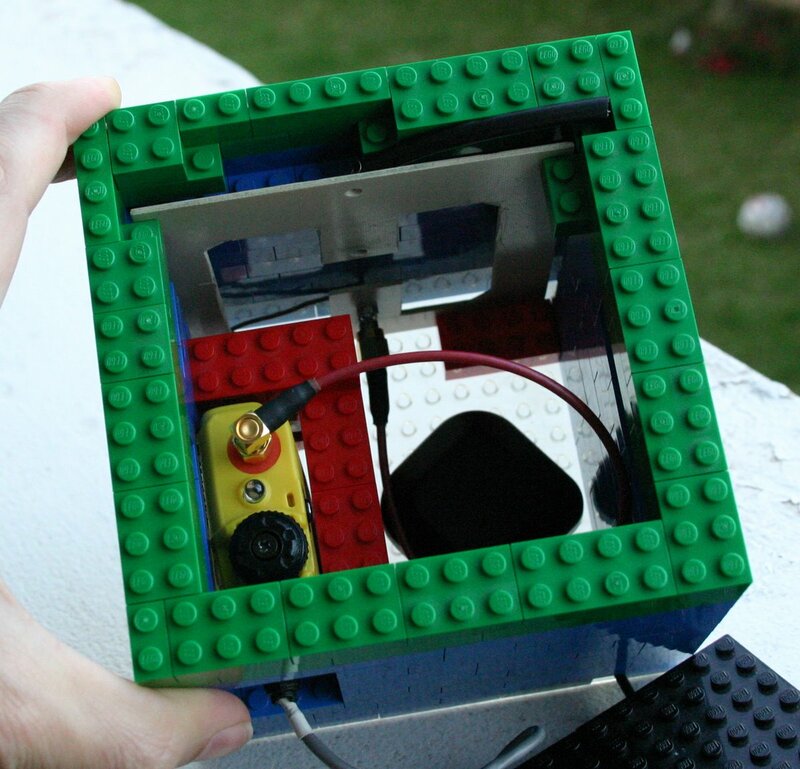 It contains the antenna, the radio, and the GPS antenna. 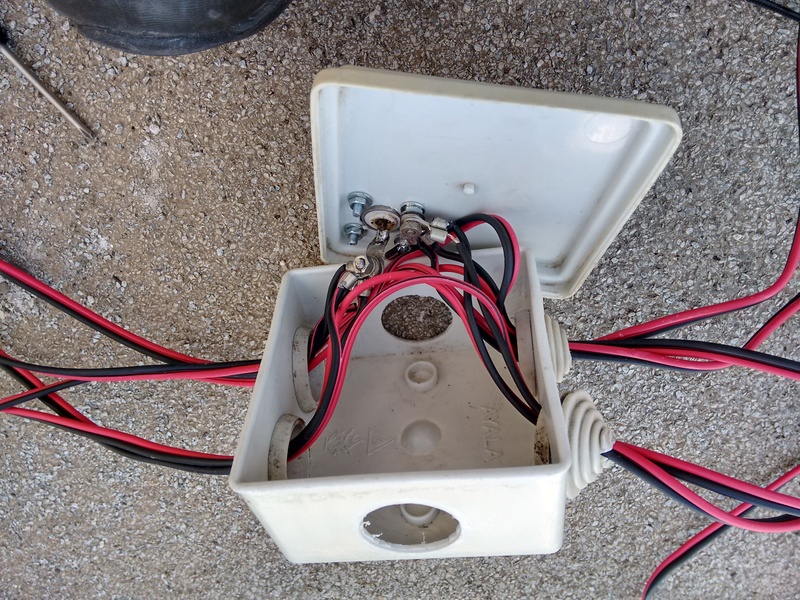 There are holes in the box for the audio cable to the microcontroller, for the GPS antenna cable, and for the display and buttons of the radio. Being able to turn the radio on and off is important, since it runs on its internal battery. The hole on the side is also large enough for the radio’s charging cable. The antenna and radio slide into specially-built compartments that hold them securely. It’s also easy to slide them out. 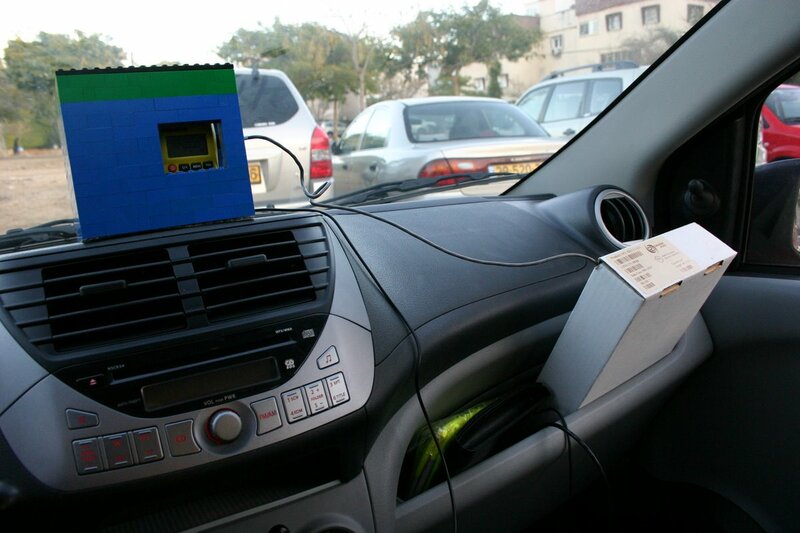 Both antennas work well inside the plastic box on the dashboard (Lego bricks are usually made of ABS plastic). The box has enough space for a small microcontroller board and for a GPS module, but my current microcontroller board is a large development board, so for now it and the GPS module still lives in a cardboard box that I stick in the glove compartment. As you can see in the snapshot from aprs.fi below, this Lego tracker actually works, even though it’s inside the car and even tough the UV-3R puts out only 2 Watts. 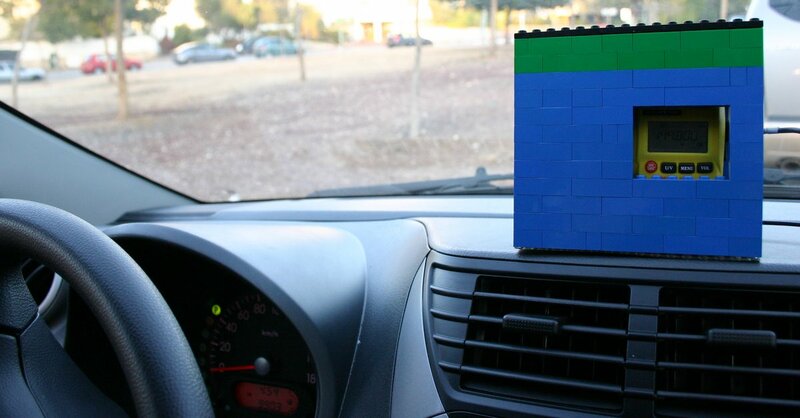 Still, I plan to deploy a 1/4-wave vertical antenna on the car’s roof for even better coverage, and I’ll probably replace the Lego with some other box, mostly to avoid havi ng the Lego bricks ruined by exposure to sunlight. 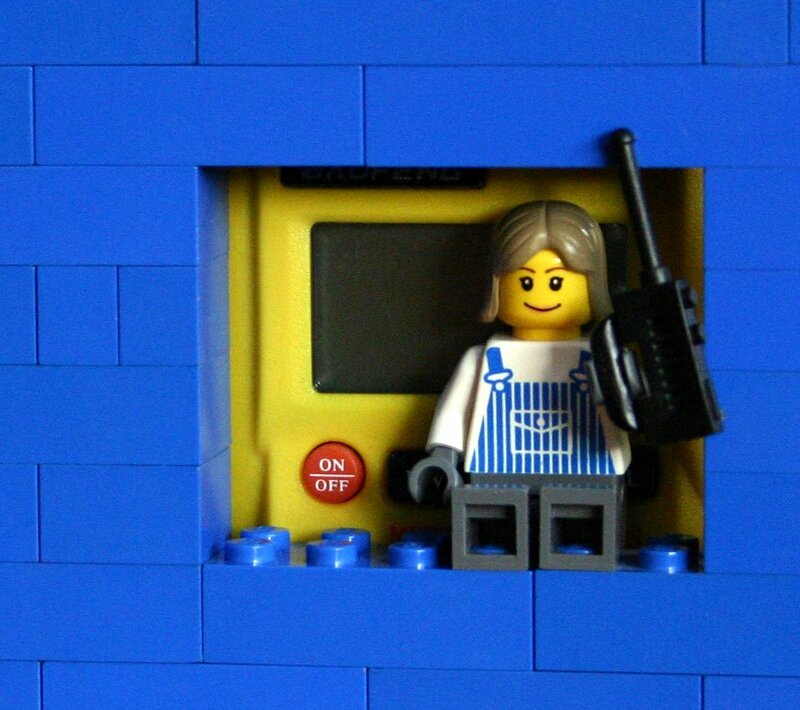 But for now, I’m using the Lego tracker. It’s also very good to know that the 10cm magnetic loop antenna works well in APRS trackers; such antennas can be used in small trackers that are completely self contained. Two more comments are in order. First, driving with a heavy tracker on the dashboard is possibly unsafe, since in an accident it might hit the driver or a passenger. I’m mostly using it around the neighborhood, but once I switch to the vertical antenna on the roof, I’ll move the whole thing off the dashboard. The other thing I wanted to mention is that I performed the two almost-necessary modifications of the UV-3R radio. One adds a capacitor to the VHF low-pass filter, to attenuate the second harmonic, and another adds a decoupling capacitor to the external transmit-receive control signal; without it, the radio often locks in transmit mode when used with a headset or an external modem.